The Carding Chronicles are short stories and sketches about the little town no one’s ever been able to find on a map. If you hit the subscribe button to the right, the Chronicles will be delivered right to your inbox. “It’s real,” she said aloud. And then she hugged herself. This morning, Jade Allbright would step over the threshold from being a student of the weather to being a legitimate, professional weather forecaster. Her bare feet hit the floor—one,two—and she squealed when her skin met the cold wood so that she nearly repealed the law of gravity in her rush to the bathroom. But just then, movement outside the small window caught her eye. Well, actually to be completely accurate, several small movements caught her eye. Snow—squalling, bawling, barreling-in-the-wind snow. Jade rushed to the big kitchen window in order to take in more of the yellow, orange and red landscape. “Snow,” she sighed. “In the middle of peak foliage.” She grabbed her cellphone to check the National Weather Service then tapped a few keys to check on Canada’s version of the same. When the phone rang, she nearly dropped it. It was her boss, Kevin Slade. “Care to come in early on your first day?” he asked. Jade had been hired to do the midday and evening forecasts because Slade was an early riser. “It’s snowing,” he said. She heard the chuckle in his voice. “I’m not telling them,” Slade said. “People are going to call and complain about something I can’t control?” Jade asked. He hung up, and Jade stared at her phone’s screen for a minute. Then she sighed, and thought about her student loan payments, and the rent on the gem apartment she had found in Lee and Chris Tennyson’s remodeled barn, and how much she loved watching the way the weather turned and twisted and double-backed in Vermont. 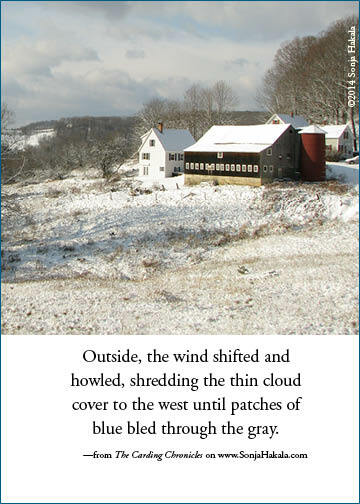 Outside, the wind shifted and howled, shredding the thin cloud cover to the west until patches of blue bled through the gray. The sun took full advantage of the opening, beaming a spotlight on the radiant leaf canopy, and Jade caught her breath at the splendid visual gift. Then the wind shifted again, the clouds hid the sun, and the color drained from the hillside. But it was enough. Jade shrugged into her jacket, found her keys, and opened the door. “That’s why we live here,” she reminded herself as she stepped outside.